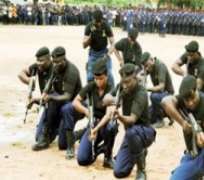 Traffic on the busy Akure-Owo Road was disrupted for about an hour at the weekend when an officer of the Ondo State Command of the Nigerian Security and Civil Defence Corps (NSCDC) simply known as Inspector Seun, engaged some men of the state command of the Nigeria Police in a free-for-all. The incident, which turned dramatic as many commuters and roadside traders abandoned their vehicles and wares temporarily to watch the event, which paralysed vehicular movement at the Ado Junction of the highway. An eye witness told THISDAY that the civil defence inspector got a beaten of his life from the policemen and was later handcuffed and taken to the Ijapo Police Division, where he was detained. The disagreement was said to have occurred between NSCDC officer and the policemen, when the later asked for the particulars of an unregistered car that the former was driving as at the time he was stopped at the junction. The request of the policemen was said to have led to exchange of hot arguments between the policeman and the civil defence officer and which later led to a fight between them. The eyewitness said all the policemen at the scene pounced on their fellow security man who had none of his colleagues around to rescue him, adding that after the beating, he was allegedly handcuffed and taken to Ijapo Police station. As expected, the incident had generated accusation and counter-accusation between the two security agencies over what happened and who was at fault. Commenting on the incident, the state Public Relations Officer of the NSCDC, Mr. Kayode Balogun, said the officer, whom he simply identified as Inspector Seun, was allegedly assaulted by the police officers of Ijapo Division while coming from Abuja with a Volkswagen Golf Car on the fateful day. Balogun in a telephone interview explained that the NSCDC officer was stopped by the policemen at Ado Junction and demanded for the particulars of the car he was driving, but that his explanation on his unregistered vehicle led to his thorough beaten by the policemen. 'Before he knew what was happening, the rest of them have joined in the beating, after beating him they tied him to his car with handcuff, tore his clothes, and detained him at Ijapo Police station' he said. On the contrary, the Police Public Relations Officer (PPRO) for the Ondo State Command, Mr Wole Ogodo, said it was the NSCDC officer that first slapped the police officer who demanded for his vehicle particulars. According to Ogodo, the men who were on duty stopped the NSCDC officer for driving an unregistered vehicle, which made the policeman to request for the vehicle partivulars. The PPRO alleged that the NSCDC officer instead of introducing himself, resulted to fighting the policemen, who wrre doing their legitimate duties.
' When other policemen on duty got there to settle the matter, he also assaulted them, even those officers that are senior to him in rank, he was rude to them, that was why he was taken to the police station that he had committed an offence,'.